In today's global business environment it is necessary to communicate successfully across cultural boundaries of languages, styles, and values. Professional Communication in International Settings provides a practical way to help individuals deal with a variety of cultural practices by systematically developing their own capacity to learn culturally appropriate behaviors and actions. Proposes a new approach to intercultural communication. Includes training material that illustrates how to effectively develop intercultural communication. Represents the outcome of thirty years of consultation experience as well as six years of research in Hong Kong, Finland, and Beijing. Yuling Pan is Managing Director of the Asian Sociocultural Research Projects, as well as Post-Doctoral Fellow in the Department of Linguistics, Georgetown University. She has trained US diplomats at the Foreign Service Institute of the US State Department and has taught in the United States, China, Hong Kong, and Finland. She is the author of Politeness in Chinese Face-to-Face Interaction (2000). Suzanne Wong Scollon is Research Coordinator of the Asian Sociocultural Research Projects at Georgetown University. Ron Scollon is Professor of Linguistics at Georgetown University. 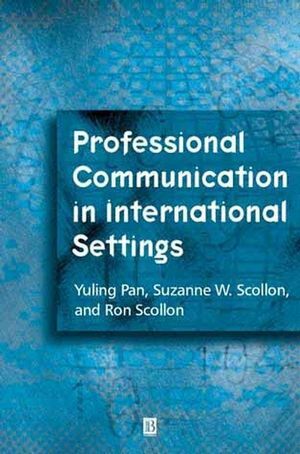 Together, they have written extensively on cross-cultural communication from academic positions in North American universities as well as in Taiwan, South Korea, and Hong Kong. They are the authors of numerous books and articles, including Intercultural Communication: A Discourse Approach (second edition, Blackwell 2001) and Narrative, Literacy, and Face in Interethnic Communication (1997). 1.Analyzing Communication in the International Workplace. 2. The Telephone Call: When Technology Intervenes. 3. The Resumé: A Corporate "Trojan Horse". 4. The Presentation: From Dale Carnegie to Ananova the Avatar. 5. The Meeting: Action or Ratification?. 6. The Reflective View: Seeing Ourselves as Others See Us. 1: The Communication Display Portfolio Exchange Planner.